The continuing HIV/AIDS epidemic and the spread of multi-drug resistant Mycobacterium tuberculosis has led to the perpetuation of the worldwide tuberculosis epidemic. While M. bovis BCG is widely used as a vaccine, it lacks efficacy in preventing pulmonary tuberculosis in adults . To combat this ongoing scourge, vaccine development for tuberculosis is a global priority. Most infected individuals develop long-lived protective immunity, which controls and contains M. tuberculosis in a T cell-dependent manner. An effective T cells response determines whether the infection resolves or develops into clinically evident disease. Consequently, there is great interest in determining which T cells subsets mediate anti-mycobacterial immunity, delineating their effector functions, and evaluating whether vaccination can elicit these T cells subsets and induce protective immunity. CD4+ T cells are critical for resistance to M. tuberculosis in both humans and rodent models. CD4+ T cells are required to control the initial infection as well as to prevent recrudescence in both humans and mice . While it is generally accepted that class II MHC-restricted CD4+ T cells are essential for immunity to tuberculosis, M. tuberculosis infection elicits CD8+ T cells responses in both people and in experimental animals. CD8+ T cells are also recruited to the lung during M. tuberculosis infection and are found in the granulomas of infected people. 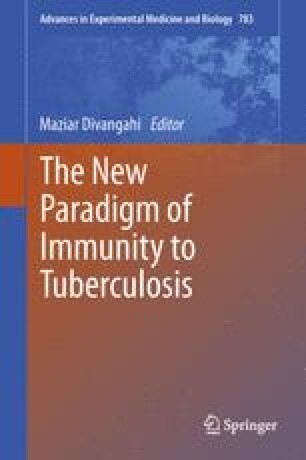 Thus, how CD8+ T cells contribute to overall immunity to tuberculosis and whether antigens recognized by CD8+ T cells would enhance the efficacy of vaccine strategies continue to be important questions.